Hiatal hernia, a type of abdominal wall hernia, is a condition in which the stomach lining pushes through the chest. The hiatus is the opening of the diaphragm, which separates the chest cavity and the abdomen. There are two main types of hiatal hernias: sliding and paraesophageal. In a sliding hiatal hernia, the stomach slides up to the chest – this is the most common kind. A paraesophageal hiatal hernia is less common and it is when a part of the stomach pushes through the hiatus, ending up in the esophagus. Paraesophageal hernia can be symptomless, but there is a raised risk that the stomach can become strangled and end up with its blood supply cut off. A common symptom of hiatal hernia is heartburn associated with the gastroesophageal reflux disease (GERD). Often, the cause of hiatal hernia is unknown. Some individuals may have a larger hiatal opening from birth. Furthermore, added pressure on the abdomen – seen in pregnancy, coughing, obesity, or straining during bowel movements – can also contribute to hiatal hernia. Hiatal hernia is most commonly seen in overweight individuals and those over the age of 50. If symptoms aren’t present in hiatal hernia then treatment may not be required, but if symptoms begin to interfere with daily life your doctor will investigate further. Common symptoms of hiatal hernia include heartburn, reflux, belching, chest pain, fatigue, and shortness of breath. 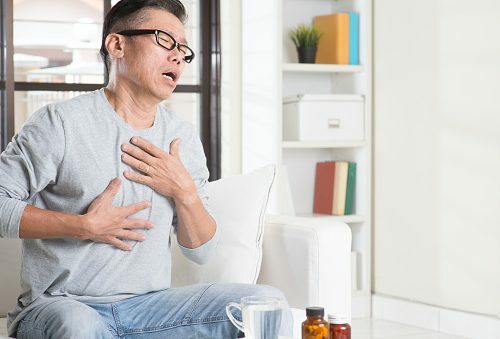 Medications to treat hiatal hernia include over-the-counter or prescription antacids, H2 blockers, and proton pump inhibitors. Sometimes, surgery may be required if medications and lifestyle changes don’t offer relief – we will outline lifestyle changes and home remedies later on. Surgery for hiatal hernia aims at repairing the hernia and putting the tissue back where it belongs. Your doctor may also use other techniques in order to strengthen the esophagus sphincter. Surgery options for a hiatal hernia include fundoplication, nissen fundoplication, belsey (Mark IV) fundoplication, toupet fundoplicaton, thai fundoplication, endoluminal fundoplication (ELF), and hiatal hernia repair. Recovery after surgery involves avoiding stress or pressure to the abdomen, losing weight if necessary, and maintaining a healthy weight. Home remedies can aid in hiatal hernia treatment, for example, eating a diet geared towards lowering symptoms such as reflex and heartburn. Recommended foods that can help minimize symptoms include bananas, apples, carrots, broccoli, rice, bread, lean meat, low-fat yogurt and skim milk, cereals, and pasta. Foods to avoid as they can worsen symptoms include citrus fruits, chocolate, fatty or fried foods, spicy foods, onions, coffee and tea, alcohol, dairy products, oil, and butter. Some lifestyle changes you can make to help hiatal hernia are, losing weight if you are overweight, eating smaller meals more often as opposed to large meals, limiting acidic foods, avoiding lying down after the meal, not smoking, and raising your pillow six inches up to avoid the backflow of the stomach content. By following these tips, you can improve your symptoms related to hiatal hernia.